Don’t get me wrong, there are plenty of great economists out there who do a wonderful job at forecasting the market’s future and catching critical turning points in the economy, but by and large most economists are rear-view mirror thinkers. They take the past and extrapolate into the future to create their predictions, which is precisely why they miss major turning points and are often reactionary in their thinking. For example, GDP forecasts tend to have a close relationship with the stock market and as stocks advance future estimates of GDP are raised and as they fall growth forecasts are slashed. 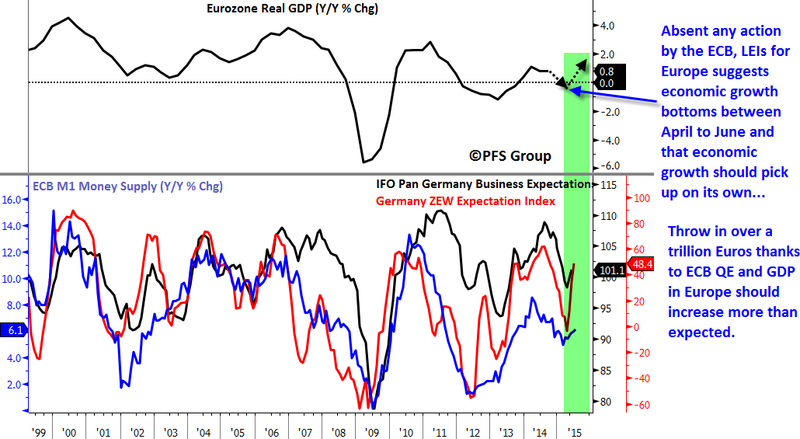 We see this in Europe where economic consensus forecasts were rising throughout the later part of 2013 and for most of 2014 right alongside a rising European stock market. However, after the European equities began to slide in the fall of 2014 so too did 2015 GDP forecasts and also what likely caught the attention of the European Central Bank (ECB). Rather than taking past data and extrapolating it into the future or basing one’s forecasts on what the market is currently doing, better calls on economic growth can be made by analyzing leading economic indicators (LEIs). Using LEIs is how I’ve been able to make specific calls on Europe over the last few years. In April 2013 I penned an article (click for link) in which I argued that Europe should see an economic recovery in the later part of 2013, which would help alleviate global growth concerns at the time. The key chart (shown below) in that article were various LEIs that argued Eurozone GDP should pick up sharply in the second half of 2013. 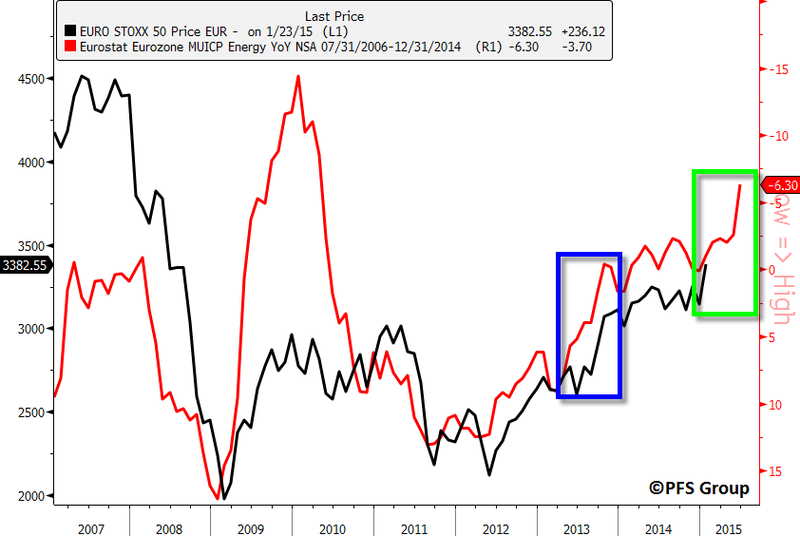 An update of the above chart is shown below and sure enough Eurozone GDP bottomed and increased going into 2014. Those same indicators warned that mid-2014 would mark a top in economic growth, which is why I argued last year that the ECB would print (click for link) with an updated version provided below. I was early on my call for the ECB to launch full-scale QE but I believe a lot of that had to do with pacifying German opposition that took a considerable amount of closed-door meetings. 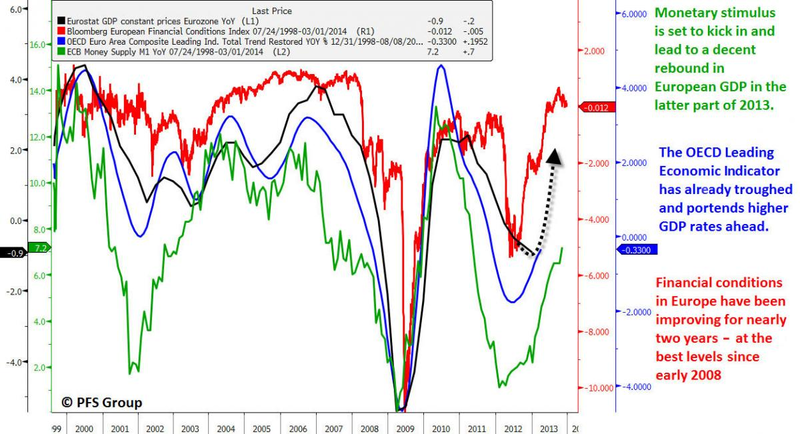 However, it is this delayed timing by the ECB that I think now sets up a contrarian play as Euro GDP based on the LEIs below is already set to trough in Q1/Q2 and then begin to accelerate again. With the ECB now throwing over a trillion Euros through most of 2016 on top, this should only add more fuel to a European recovery. 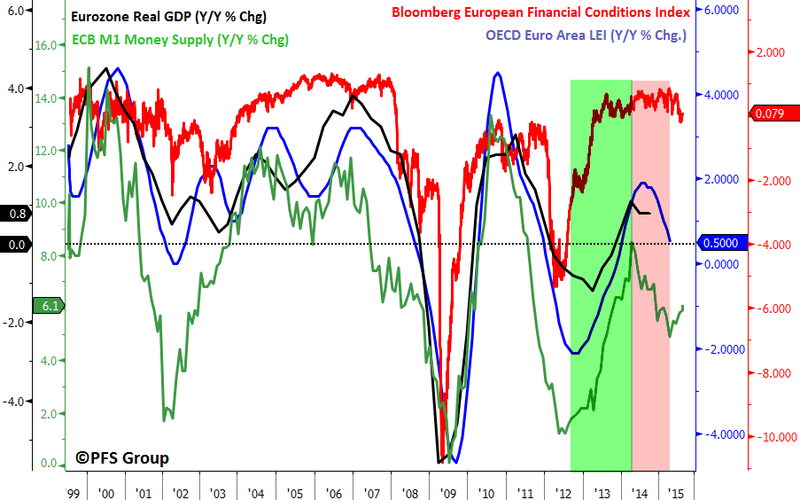 In addition to the German LEIs and ECB M1 money supply growth rates above, other indicators and market signals are pointing to a European recovery. 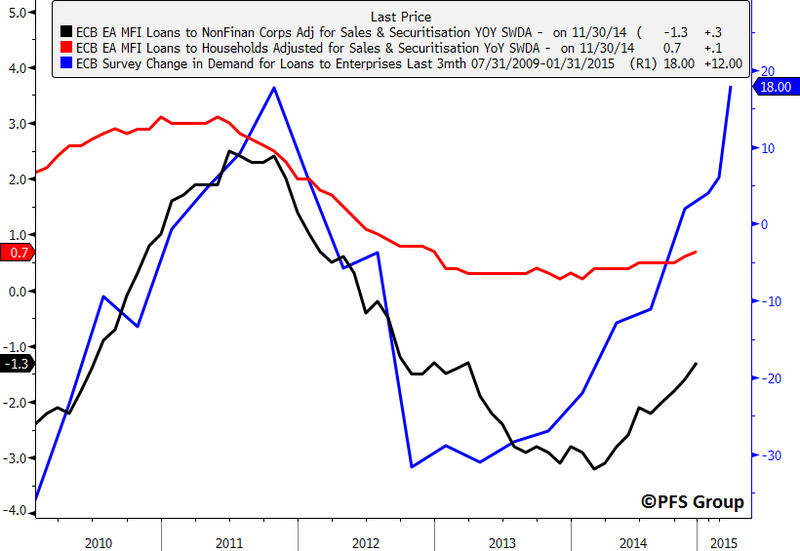 For example, European loans to households appear to be bottoming (red line below) and loans to nonfinancial corporations (black line below) have improved from -3.0% to -1.3% and could breach positive territory in the next few months. 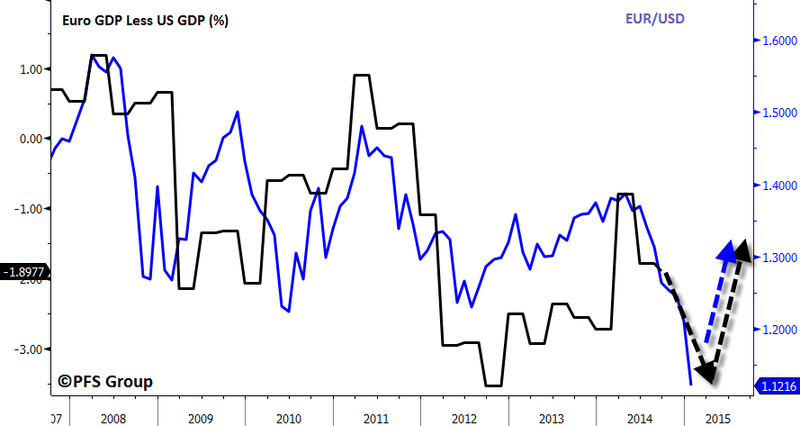 Growth in lending should continue in Europe given the demand for business loans is near the highs of the last five years (blue line). 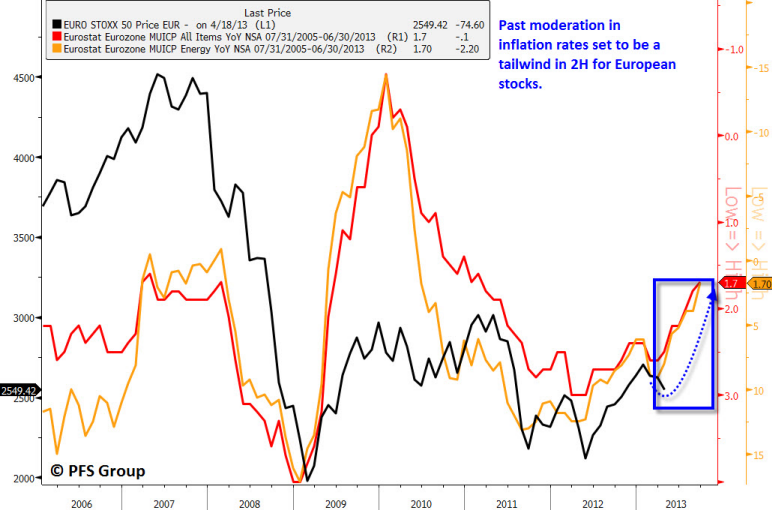 One of the relationships I showed in my April 2013 article was how inflation trends tend to lead stock market returns and argued the large decline in European energy inflation rates should see the Euro Stoxx 50 Index rally strongly in the second half of 2013 with the key chart in the article highlighted below. 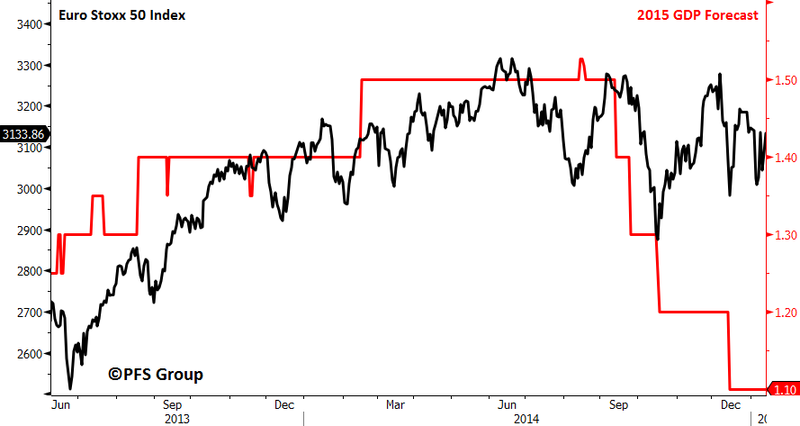 An update of that chart above is provided below which showed we did see a powerful rally in European equities in the second half of 2013 and now suggests European equities could see another powerful rally ahead. Outside of economic data we are seeing signs from the market itself that European growth should not only stabilize but improve significantly beginning in the middle of the year. The market often provides a great read on future economic growth by looking at the relative performance of early cyclicals versus late-stage cyclicals and the current read across the Atlantic is encouraging. 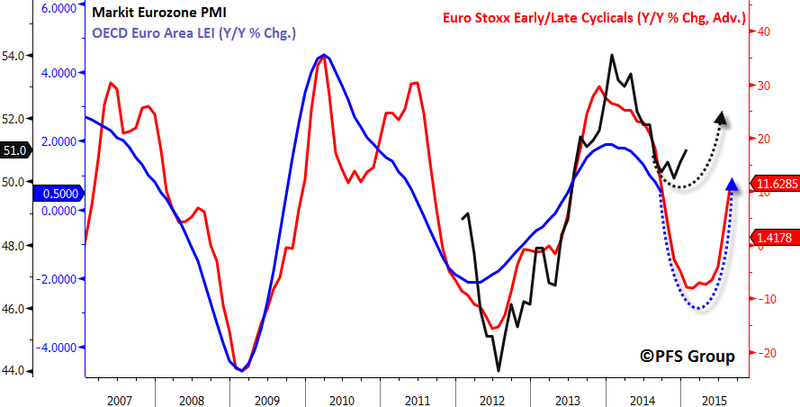 The relative performance of the Euro Stoxx early to late cyclical sectors turned down sharply in early 2014 and predicted the slide in European growth. However, we’ve seen an important turn in the relative performance that corroborates the data above in calling for a European recovery in the second half of the year regardless of what the ECB does. 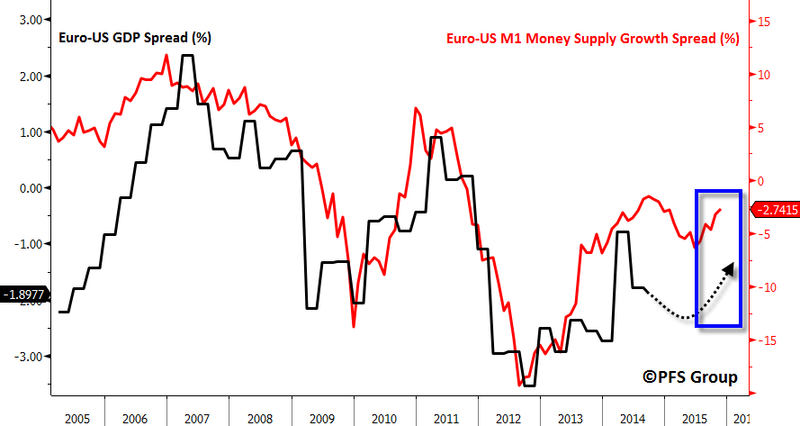 Not only does the rising money supply growth rate in Europe argue for a European recovery in the back half of 2015, relative money supply growth rates argue for the European economy to begin to outperform the U.S. For example, the spread between European and U.S. M1 growth rates argues that Europe should continue to underperform the U.S. economy until the middle of this year but thereafter Europe should begin to outshine the U.S. If growth in Europe begins to outpace that of the U.S. we should begin to see confidence in the European economy begin to improve and as it does capital flows from the USD should move back into the Euro and see it appreciate relative to the USD. The relationship between relative growth rates between the two nations and their exchange rates is shown below and argues the Euro should find a bottom in the middle of the year. This article is getting a little long and so I will be outlining potential contrarian beneficiaries from an accelerated European recovery and a bottom in the EUR/USD exchange rate in my next article. Even without the ECB stimulus announced yesterday the European economy was slated to begin a recovery based on leading indicators. Sadly, the ECB is likely to get all of the credit for any European recovery even though cyclical forces were already at work and calling for an economic trough. Regardless, there will be winners and losers from a strengthening European economy and currency which I will be highlighting in my next article.